A new interface between SpeakerLink equipment and standard/legacy/nonSL equipment is now available. It's called the REVIVER, thanks to Carl, George, Jaco and VirusKiller for their knowledge and their mental support. This tiny box is well proven and tested from me and many other another Hitchhikers. The REVEIVER is a cooperation product from a German audio-studio supplier and me (Robert Wistrela) with the "magic 4 HH". The concept is that each DSP should have that cheap interface and get then the full advantage of the SL/CAT5 cables. The box CAN be used also for a speaker pair and CAN be used in combinations with the AC12. Please ask only open question for orders (what are not covered on my homepage) in the restaurant-post. 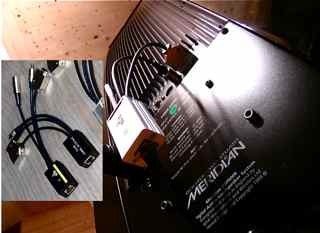 Of course, the REVIVER can be used for many applications where an interface between SpeakLink and SPDIF, Meridian Comms and RS232 is required and custom versions can be built on request. I.e. the Reviver can be supplied with either a 180 or 240 degree 5 pin DIN plug for comms.